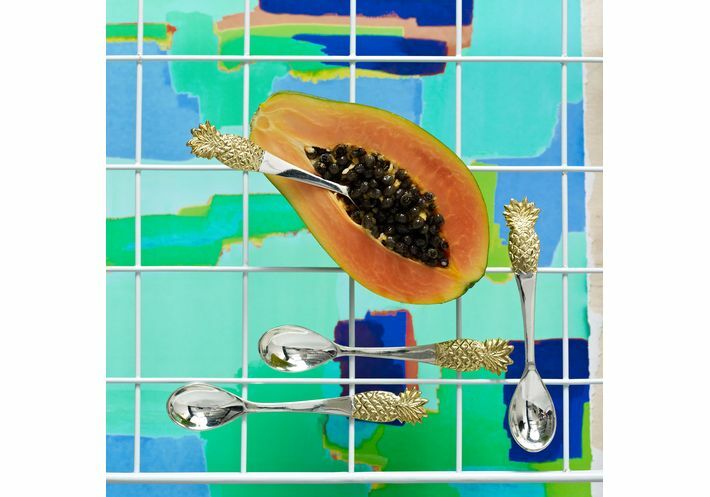 Interior trends often reflect fashion trends and vice versa, which means that not only can we find pineapples on necklaces, t-shirts and Valentine's Day cards but also in our homes - and not just in our fruit bowls either. As I've mentioned before, fingers crossed we will shortly be having our house knocked around which should result in a big open space for eating, socialising, working and playing pool or table tennis. Whilst I can't quite envisage the space, and whilst I'm not yet sure which larger pieces of furniture we will need, other than a new dining table, I'm quite excited about the bits and bobs and finishing touches. I guess that this is slightly the wrong way round but I always think that if you love something, you will find the perfect home for it. For my last birthday and for Christmas, I asked for gift cards which I have been squirrelling away in anticipation of those things which catch my eye - of which there seem to be many. 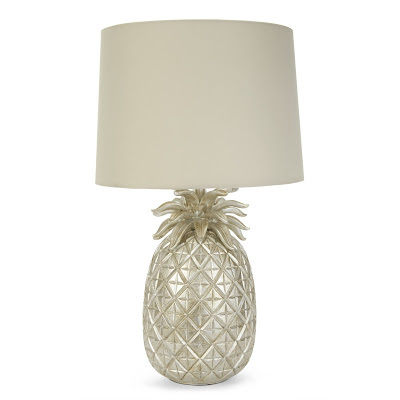 And something "pineappley" is near the top of my list. 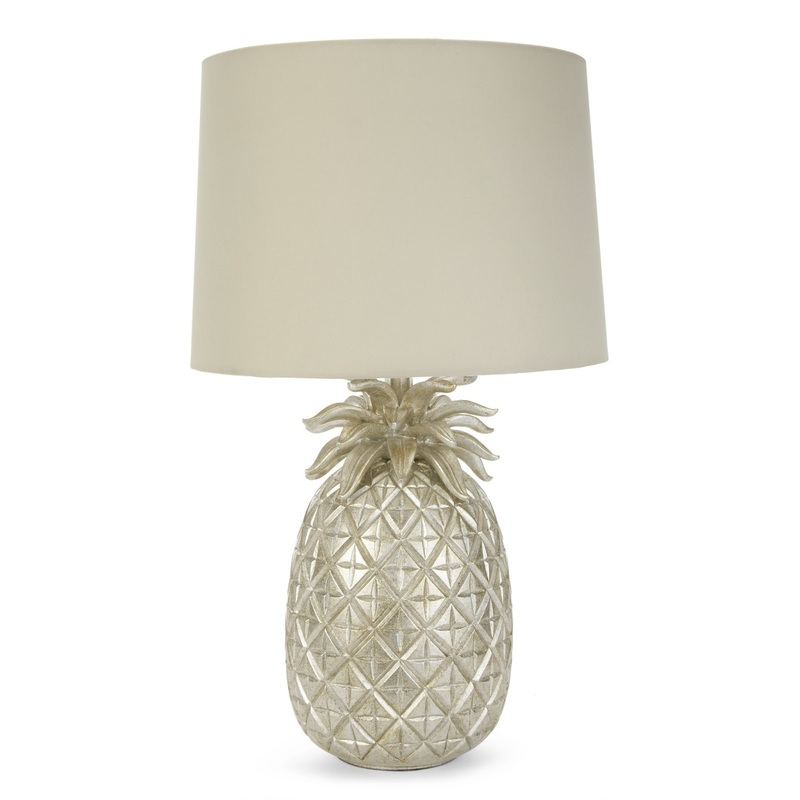 I came across this Laura Ashley pineapple lamp (£96 was £120) today and immediately fell in love with it. I've made huge amounts of progress with Mr SG this weekend and he can now talk about the work on the house for about 10 minutes before needing to go and lie in a darkened room. Or reaching for the bottle, which is followed by a lie down in a darkened room. I actually managed to get him into Laura Ashley with me today and he liked this lamp. So that was a good start. We had actually gone into Laura Ashley for a different interiors gem but I'll save that for another day. 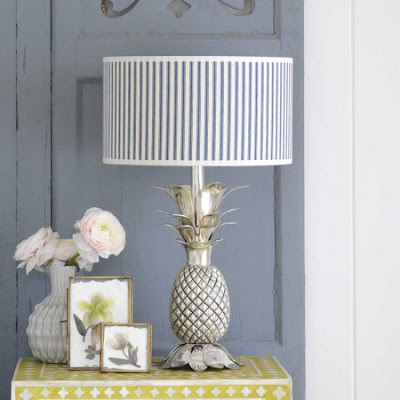 Graham & Green and has long been a favourite place of mine to browse interiors and this pineapple lamp base (£125) comes a very close second to the Laura Ashley lamp above. The reviews of it are really good and I love the choice of shade, although there are plenty of other options too. 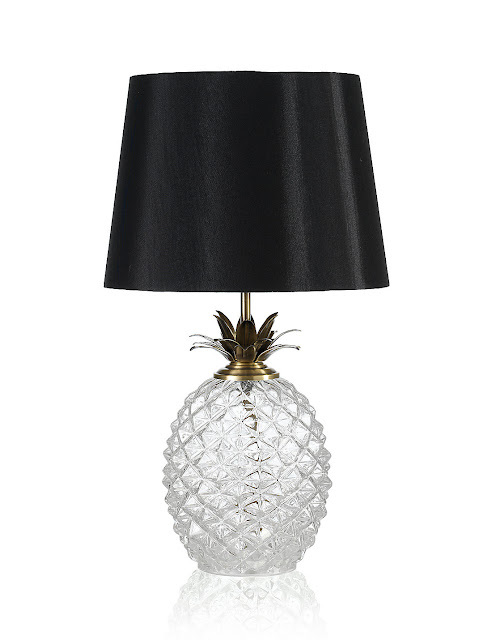 For those who would prefer a glass option, M&S has this pineapple lamp for £49.50. Compared to the other two styles, this one is quite a chubby pineapple! For anyone who would prefer a pineapple "object" as opposed to a lamp, John Lewis has this gold pineapple vase (£40) and in the picture below, you can see how fab it looks in a room setting. 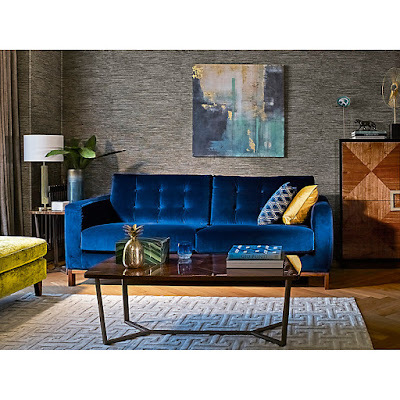 In fact I really like the whole of this look for a living room but I suspect that there are many rooms like this all over the country, given that John Lewis has marketed this look so heavily. Oliver Bonas is a great shop for bits and bobs and they have these gorgeous pineapple spoons (£18) which could be displayed in a non-kitchen setting. They also have gold pineapple salt and pepper pots in store but not online. As with fashion, there's always the issue of how much money to commit to a piece that may only be a trend for a few seasons. On the other hand, if we love something, I don't think that any of us will stop loving it just because it's no longer "the" trend of the season. 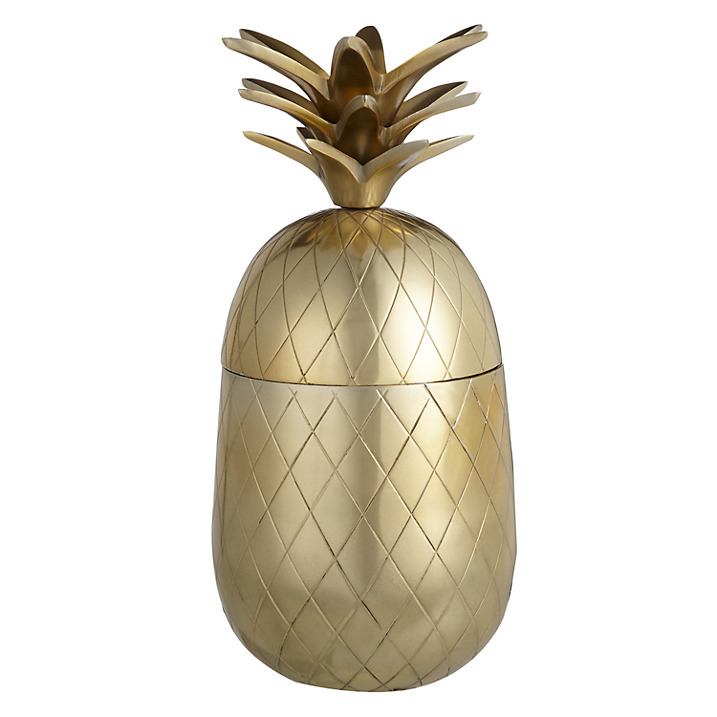 So, what are we thinking about the Pineapple trend? Yeah or meh? Cropped wide legged trousers - fancy giving them a go?! Remember the wide legged Renee cropped trousers from Whistles that I told you about not so long ago? Well here they are in action. I know, it would have been nice to have got a better photo than this but I wore them to the Hush preview day and as I left the house at 5.25am and returned home and changed prior to the school run there wasn't anyone to oblige (implying that someone obliges on other occasions which is kind of stretching it a little). I really liked wearing these trousers. The fabric is beautiful and it falls really well. Plus they're a little different. I should add however that the waistband is high and pretty small and two pieces of Deliciously Ella's flapjack and several of her juices left me feeling somewhat errrrm uncomfortable. But it was so worth it. I've also tried these trousers with ankle boots, ghillie lace ups and block heeled shoes and they work with all of them. So they will all be combos that I will be wearing, especially when the weather gets warmer. But maybe I should leave the flapjacks (which were the size of bricks) out of the equation. Yesterday I had a trip to London for a preview of Hush's S/S '16 collection. Not only that but breakfast was provided by the Mae Deli, which is Deliciously Ella's new enterprise. Being a fan of Deliciously Ella's recipes, I couldn't wait to see what was on offer and I wasn't disappointed - juices, mango flapjack and chia pudding. Hush clothes, plus food from the Mae Deli - what more could a girl want? Well nothing really but then when Amanda, The Online Stylist, and Frances from School Run Style arrived, the day turned from a lovely one into a fabulous one. It was also lovely to meet Vikki from Style & Minimalism Joanne from The Stylist and the Wardrobe and Sylvia from Sylvia Sparkles. It's so nice to put voices to faces and to share experiences, challenges and successes with others. Their blogs all make for a brilliant read so do drop by if you have a spare minute or two. So as to the clothes, there were several different stories in the collection, from paler blush colours to graphic prints and from khaki to brighter colours. They included the softest cashmere ever, lovely knits, swim wear, beach dresses, a fuller cotton skirt, gorgeous shorts in fluid fabrics and leather pieces too. Plus shoes - oh the shoes! I pretty much think that these shots speak for themselves, so I'll let you take a whizz through them at your own pace but let's start with accessories. 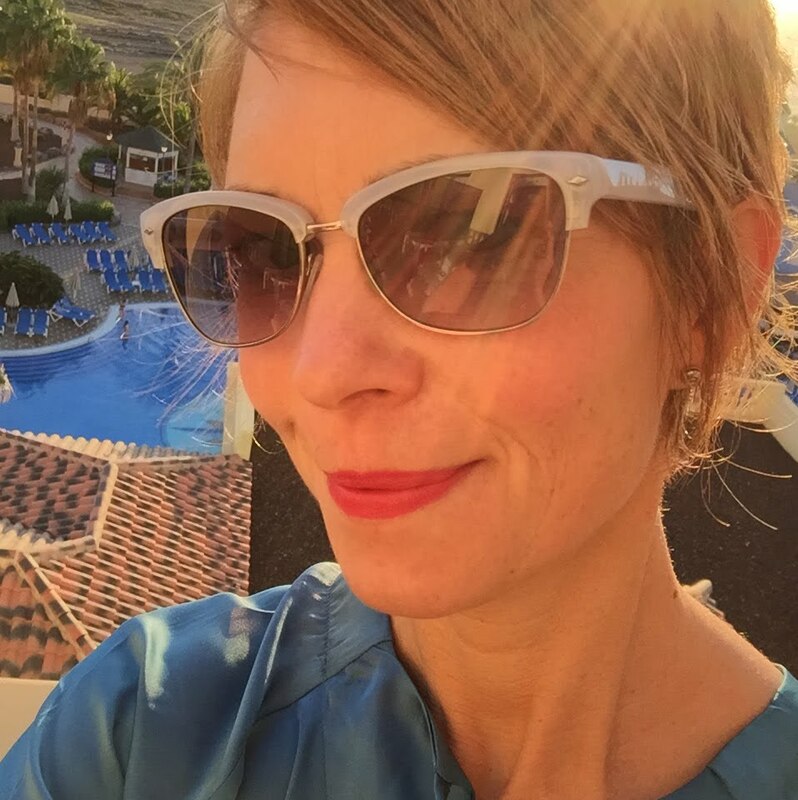 Beautiful sunglasses - a real outfit maker (and hider of wrinkles). 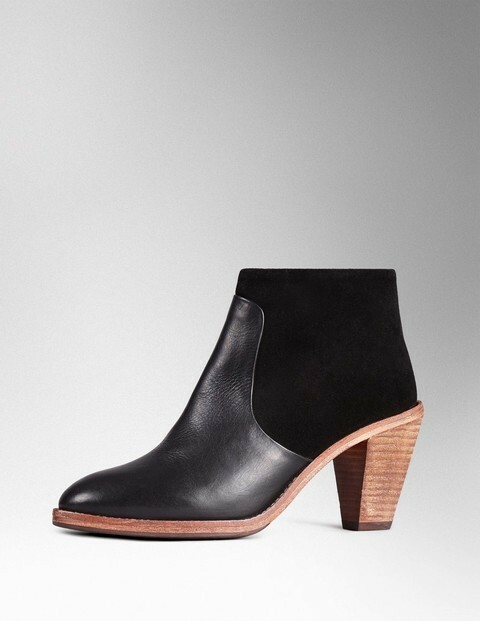 I just wish that I could bring myself to wear them in the winter. Life would be a whole lot easier when it came to taking early morning photographs. Graphic and neon. Just gorgeous! I love a tassel. Beach, festival, school run, day chilling at home or out for a BBQ - they are the necklace of the summer. Good to see that pineapples are still having their moment - and strawberries too. 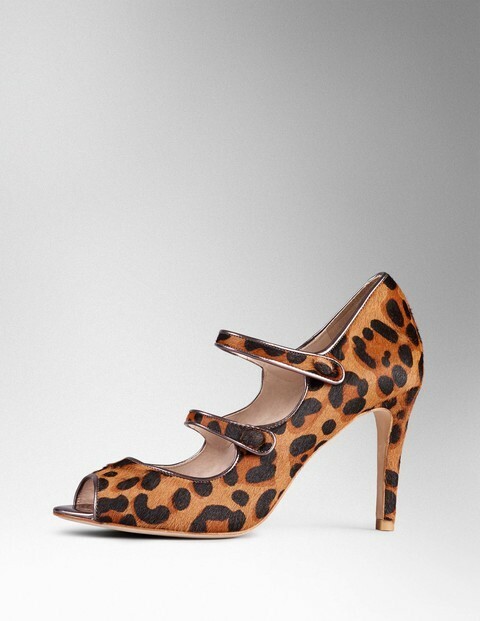 I love both of these cheeky little numbers! Stars, like stripes and leopard print, won't go anywhere. Ever. (Well I don't think that they will)! OK so let's take a look at shoes. These are now made in house rather than being outsourced, as are the leather pieces (black A-line skirt and biker for this season.) Heels, flats, sandals, brogues, flatforms, trainers - Hush has all bases covered! And now on to T-shirts. I'm not a huge t-shirt fan and the older you get, the more they need to be right to avoid looking, well, rubbish really. But I think that the cut, and these stars, would help with that. And I know that I'm a cliché but I'm a sucker for a palm tree. Maybe not in the "Club Tropicana" Wham type way but a subtle palm tree gets me every time. If you haven't yet ventured into the dangerous waters of a logo sweatshirt, this could be the perfect time to start. And as for a smiley sweatshirt. Well I think that this would look just perfect on a rainy beach in Guernsey. Maybe Hush could start doing brollies too. See what I mean about a palm tree? I love this colour and it has a depth that works for me. Much as I love the paler blush pink of which there is so much this season, it really doesn't like me. Flamingos are still having their moment too - from glasses that I recently bought in Ikea, to a new ironing board cover with flamingos on from John Lewis (I know, living life on the edge again) they are still finding favour. And saving the best until last, this was my favourite piece out of everything. Why? Well it's simple and chic in a "dress up, dress down" type way. And I'm happy to embrace off the shoulder as a trend but only if the piece is simple like this, rather than frilly as otherwise I think that I would feel a little ridiculous. Oh and I love the trim too! So let's talk temptation! Are you tempted with anything here? Here I've linked to the pre-collection (which includes the beautifully soft cashmere jumper, the leather skirt and leather jacket and an amazing jumpsuit) with the rest of the collection going on sale mid February. Enjoy! Recently I've had quite a few people asking me what I think about the use of protein powder. "Protein" is the new buzz word, whether it be in the form of shakes, powders or bars - and everyone is jumping on the protein bandwagon. But let's start by taking a step back and looking at why protein is important for us. To quote Jamie Oliver "Protein is the building blocks of our bodies. It is absolutely essential for the growth and repair of muscle tissue, as well as building hormones.....protein really is your best friend and should be enjoyed in the right way." OK so that bit we get. Growth, repair, keeping us healthy - that makes sense. As to the science part, essentially there are complete proteins, which come from meat, fish, eggs, milk and cheese and these contain all of the essential amino acids. And there are incomplete proteins, which can be found in beans, nuts, seeds, lentils, cereals, quinoa, oats, tofu, bread, flour and corn. Mixing incomplete protein sources together can provide a source of complete protein. So far so good. And so what are our protein needs? For women aged 19-50, the optimal amount of protein to aim for is 45g a day. By way of example, 100g Total Greek Yoghurt has 9g protein, 100g cottage cheese has 6.1g, a typical egg has 9g, half a medium sized tin of tuna has 20.3g, an average sized chicken breast has 30g and 100g of smoked salmon has 23.8g. The claims - When we work out we create small tears in our muscles. As the tears repair, the muscles become bigger. The claim is that protein powders deliver protein to those damaged muscles as quickly as possible post work out, to assist in repairing and re-building the muscle fibres. The caveat to the post! Now I'm no scientist (and please do feel free to point out where I'm slightly off point) but there is no right or wrong answer when it comes to supplementing your diet with shakes, powders or bars. It's not something that we have to do as a good diet should be able to provide all of our protein needs - but many people choose to supplement their diet in this way and it really is a matter of personal choice. 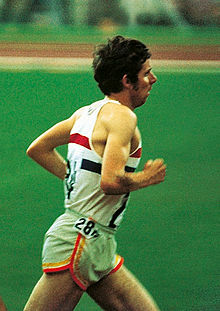 Brendan Foster at the 1972 Olympics. A 70's style Harry Styles. Sort of. The cost : These various supplements aren't cheap and if I'm spending those extra pennies on something that claims to deliver, then I would like to be sure that it will deliver. The ingredients: Now this is where I start to struggle. I just don't like the list of ingredients in some of the various different options. I might be wrong but many of these products look highly processed. I've come across protein cookies which contain palm oil, sugar, artificial sweeteners, emulsifiers and flavouring. I've also looked at protein bars, which similarly contain sugar in various different guises, preservatives, thickeners, E numbers and gelatine. As to the protein powders, many contain emulsifiers, flavours, colours and sweeteners. There are some out there with very few ingredients (see below) but in general I was surprised with what I found. The side effects: This is my biggest worry! 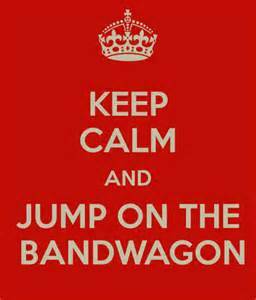 It concerns me when people start throwing things down their necks willy nilly just because it seems to be the thing to be doing. The research would seem to be limited but there are suggestions that too much protein can result in osteoporosis and kidney problems. No doubt people would have to consume huge amounts of protein but it's early days yet. Who knows what we will discover down the line? 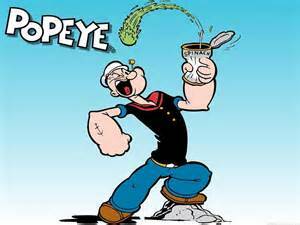 I suppose that the difference between getting protein through food is that your brain tells you when you're full, so overdosing through vast quantities of meat, eggs or fish is probably less likely than taking too much via an extra scoop or two in a shake. What do others do? Sometimes it's good to take a look at what others do who you trust. Joe Wicks, the Body Coach, advocates the use of protein powder on occasion without a problem. Kayla Istines, another of my favourites, doesn't advocate the use of protein powder personally but instead relies on food sources to keep her protein levels up - and she has an incredible physique. 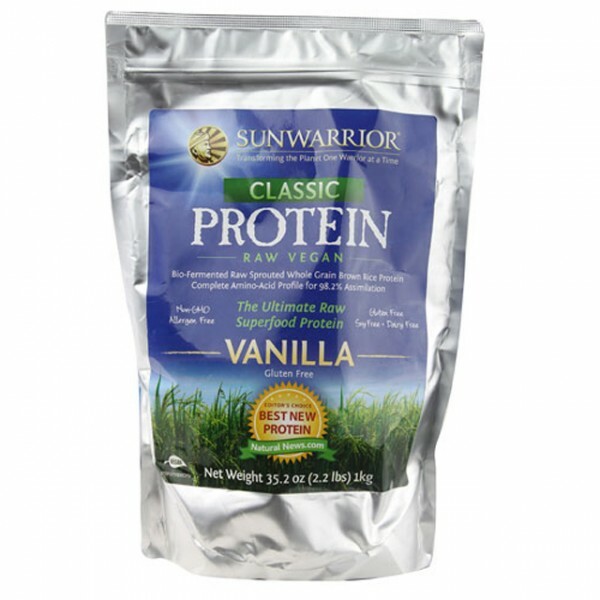 Madeleine Shaw recommends the use of the vegan Sunwarrior protein powder which costs £34.99. In fairness, all that this contains is raw sprouted whole grain rice protein and salt. So maybe for anyone tempted to go down the protein powder route, it's worth taking a closer look. The claims. So do these powders, shakes and bars really do what they say on the tin? Well as ever, where do you start when looking at all of the evidence available? To be honest I'm pretty sceptical about most things that I read as most articles have an agenda. In a recent Episode (Series 4 Episode 1) of "Trust me I'm a Doctor" the various claims were put to the test. First, it was established that the protein consumed in a protein shake immediately post work out did indeed travel to the muscle. So far so good. Next an experiment was conducted on a group of 20 volunteers aged 67 to 24 to see whether having a protein shake post work out helped build any more muscle. Both groups took a shake immediately after exercise with one group taking a placebo. Both groups lifted heavy weights three times a week and after eight weeks the results were analysed. Everyone got stronger by about 30% and all had bigger muscles but there was no difference at all between the two groups and the protein shakes did not provide any benefit. It was concluded that there is a limit to what your body can cope with and as long as you get enough protein in your diet the body will either turn that excess protein into energy, store it as fat, or expel it via urine. No doubt the experiment is open to criticism on many different levels but you have to start somewhere. What do you think? If you take protein powder I would be really interested to know how you get on with it and whether you've noticed a difference in any way. And if you don't already take it but you're thinking about it, does this change your view either one way or the other? I don't know about anyone else, but I'm not really a fan of the sales when they first start. They are always crowded plus I tend to be on school holidays when they start - and children and busy shops definitely don't mix. Nope, I prefer the sales when they are drawing to a close. When the stores go into final markdowns and there are discounts of 70% to be had. Yes, that's more like it. OK so I'm slightly late to the culottes party but I saw these earlier in the season and I liked them very much. When they presented themselves to me on my recent travels, I thought that it would be rude not to at least try them on. And would you know it, they came home with me! These are the Hobbs Hazel Culottes (down from £110 to £33). New Balance Vazee Rush Trainers - oh boy, they're good! 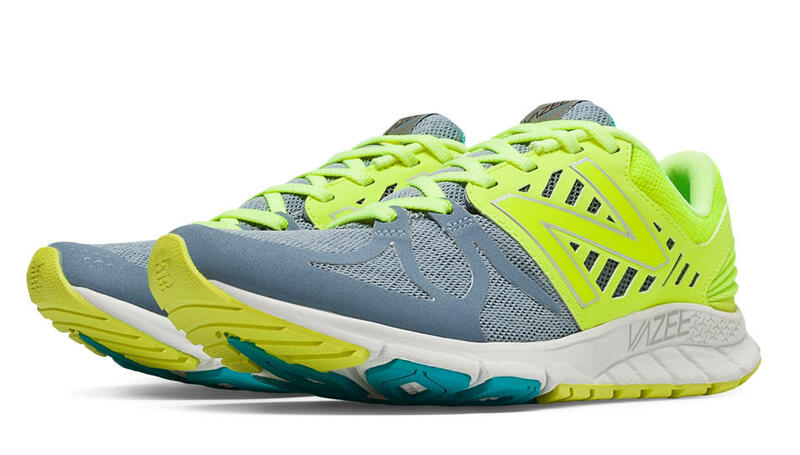 "Built for athletes who seek the ultimate in cushioning and flexibility for their workouts, these running shoes deliver a comfortable ride mile after mile." Recently I was lucky enough to be gifted* a pair of New Balance trainers. When it comes to trainers I tend to have two "active" pairs. One pair for running, which are filthy because we do a lot of running along the canals which can be really muddy. And then I have a pair that I wear indoors for the other workouts that I do. Having two pairs of trainers on the go at the same time sounds a little indulgent but it only really came about by accident when I bought a pair of Asics for running in but I couldn't get on with them so I "relegated" them to my indoor workout trainers. And you know, we get along quite nicely like that. The house doesn't get all muddy, the Asics look pristine plus they get worn rather than being abandoned and it's probably good for me to swap between the two pairs. Although I'm generally a size 6, because trainers always come up small, I opted for a size 7. I wasn't sure whether they might be too big but I could tell as soon as I put them on that they fit perfectly. And then I walked around in them. Oh boy are they light? (181g or 6.4oz to be precise). I don't think that I've ever worn trainers as light as these. 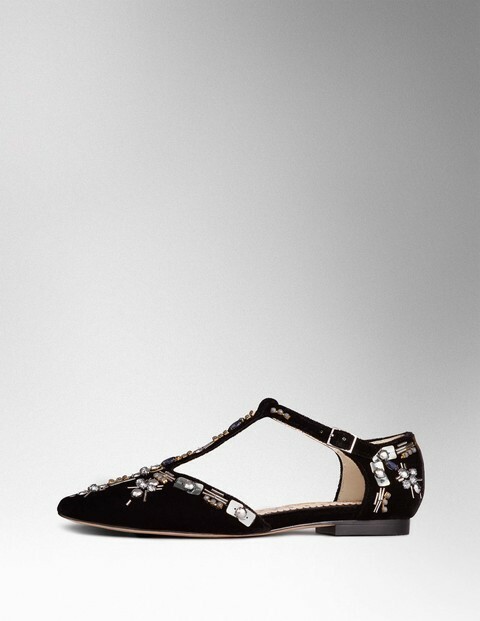 But at the same time they are really substantial around the heel so they feel really snug and supportive, which I like. I haven't yet worn them outside for running in but I think that I may give them a whirl around the block tomorrow when I do some hill work. Frankly I need all the help that I can get and a lighter pair of trainers may just give me a little something. Plus, much as I love my usual running brand, they are a bit boring on the looks front (shallow comment alert) and it would be nice to see something a bit more interesting at the end of my legs when I'm plodding the streets. And this is what they look like at the end of my legs. I always think that it's funny seeing things from someone else's perspectives. You get so used to seeing how you look and I bet right now, people are thinking "Oooh she's got short legs" or "Oooh she's got long legs" or "Oooh she's got chunky thighs" or "Oooh she's got skinny thighs" because these things are all relative aren't they? So there we go. It's always risky reviewing an item but trainers must be one of the trickiest because it's so important they are not only right but more than right. And these are. In fact given the choice tonight (for HIIT training) and last night (for resistance training) between the Asics and the NB, I chose the NB, which pretty much says it all. In addition to neutral running trainers, NB also make trainers for those who pronate and trail trainers too. I have to say that I'm new to NB so I would love to hear whether anyone else out there wears them and if so, what do you think? *For disclosure purposes, I realised that I was going to receive a sample pair of trainers but I assumed that this meant that I had to return them after I'd worn them briefly (indoors). However when I enquired about how best I should return them, I found out that I was able to keep them - which I am delighted about as they are rather lovely. A Quick Outfit of the Day...warm and comfortable is fine by me! Remember the Jigsaw jumper dress and Karen Millen pleather leggings that I said I would probably wear from now until April? Well here they are again ! The outfit worked for our trip to see Joe Wicks so I figured that it would work for a Pizza Express birthday party. The gloves are from Whistles as is the bag (both sale items from last winter and last summer) and I can't remember where the hat is from but frankly I just need to wear a hat all the time right now. My hair is driving me nuts. I fear that it will be chopped again sometime very soon. And I thought that I would share with you great insight and self awareness from the now 8 year old. "Mum" she said "I'd love to be Sports Captain or House Captain at school and I've told everyone about it." "Oh that's lovely." said I "Who chooses who gets to have these roles?" "Well you need to tell them too then." "Oh, they would never choose me. I'm far too irresponsible. I mean, have you seen the state of my room? It's meant to be tidy and it looks like a pig sty." I wasn't sure whether to laugh, offer encouragement that that wasn't the case....or tell her to go and tidy her pig sty like bedroom. It amazes me how children can suddenly become so wise and have such great insight about themselves. I'm hoping to nip into town tomorrow for a last quick whizz around the sales. Anyone on the lookout for anything in particular?! Before I start, you may notice that I've had a bit of a blog tidy up. As a result there may be a few glitches along the way - no-one's fault, it's just technology. However if that is the case, just let me know and I'll do my best to sort them out (like the spacing and links for example!) And thank you for bearing with me! Our eldest came to me the other morning. "Mum" she said "I had this horrible dream last night. I dreamt that you bought me 14 of the same workout tops and you told me that I had one for every day of the week. When I told you that there were only seven days in a week you said that I was working on a two week cycle." Lucky her - 14 new tops! Which got me to thinking about workout tops (not about the psychological damage I've clearly done to our 16 year old, which is what I probably should have been doing). As I'm doing quite a bit of training for the London, Marathon, I'm washing a lot of workout gear and to be honest, a lot of my tops are looking a bit tired. Many of them are from Primark and they've served their time, so I thought that it was time for an update. Which led me to H&M. One of our Birmingham stores has quite a good selection of fitness wear which I love rifling through when I have a minute. There doesn't seem to be a link to the above sports bra which I love (although I see it more as a cropped top to be worn over a sports bra) but I have linked to the selection of sports bras available. But to be honest it didn't love me at all. It just wasn't substantial enough to cover my less than insubstantial sports bra. Ho hum. I also picked up this 3 pack of hairbands for £1.99 because I loved the colours and my hair is irritating me right now as it's at that yucky in between stage. I really liked this top in the shop but the thing that I didn't really like about it when I put it on the is that it looks all sweaty around the neckline (see below). Not a good look. Also, although it was £12.99 it didn't seem any better than my usual £3.99 Primark cropped tops. So that will be a return then. But I did like the vest, below and I've worn it already. Again, it's not on the website but I've linked to the vests that are available. Everyone has really personal taste when it comes to vests but I prefer everything quite fitted, rather than flapping around. For anyone who hasn't checked out H&M active wear before, it's great for something stylish, fun and functional. Plus there's a great selection of bottoms, jackets and accessories too - so definitely worth a peek. A Jigsaw jumper dress, Karen Millen pleather leggings and an evening with "Joe"! Some may say that I was the lucky one, getting to meet Joe Wicks, the author of Lean in 15 and soon to be global superstar (I just said that for effect but it could be true) but actually he was the lucky one because....he got to see my new Karen Millen leggings and Jigsaw jumper dress. Honoured he was. Honoured. Somehow I managed to get tickets to Joe's book signing in Birmingham. I booked them before Christmas, not even knowing whether my friend and I had even the vaguest notion of getting there. With six children between us and with the book signing being at 6pm on a Tuesday it looked unlikely but the respective hubbies came up trumps. For those who don't know of Joe, he's the biggest fitness sensation for years. His 90 day Shift, Shape and Sustain plan has been signed up to by 90,000 people, he advocates 4 or 5 HIIT sessions a week which last for no more than 20/25 minutes, he posts his workouts on YouTube and his recipes on Instagram via short vidoes - and all of this has happened in the last couple of years. Now there's a book with two more later in the year. 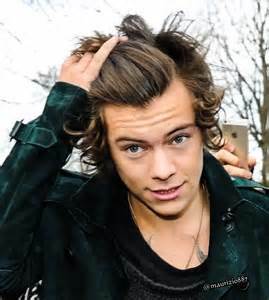 He is currently everywhere - on the radio, TV, magazines, newspapers. He's even been on Lorraine. What more can I say?! Come on guys, no need to fight it out over a"Lean in 15" book, there are plenty to go around. The first thing that struck us about Joe is that he wasn't as big as we thought. On his YouTube workouts he looks about 6ft and very broad but he's actually quite slight. And he's not as big as his instagram persona either - in fact he seemed quite shy. Poor guy, he probably didn't know what had hit him. I have to admit that we were slightly hyper but I think that was because we were out at 6pm on a Tuesday as much as anything else. Living life on the edge again. So, as to an interesting interesting fact about Joe, he finished the London Marathon in 6.5 hours and was overtaken by a pair of testicles. Again, what more does one need to know?! Having a chat with Joe whilst he signed my book. It's weird when you've spent so much time looking at someone on a screen (I do quite a few of his HIIT sessions via YouTube) and then you meet them in the flesh. Like there's a danger that you'll be overly familiar or something. And here's a slightly closer/slightly blurred look at the outfit which was taken the following morning. Well, I had only worn it for a couple of hours the night before. And it's so warm and comfortable that this is it for me now until April. I don't think that I've ever been in an Instagram post with 2,384 likes before (now 4,828) - and am probably never likely to be again. Spot the grinning idiot?